Elliptical machines are sometimes called skiing machines due to the motions of the feet and legs while using an elliptical trainer. The motion sends your legs back and forth, rising and falling slightly, in a hybrid of the motions created by treadmills and stationary bikes. Elliptical trainers are designed to provide specific benefits to runners, but one of the drawbacks is accurately charting how many strides, or revolutions, performed on the elliptical equal a mile. Elliptical machines are often sought out by individuals who want cardiovascular exercise without the physical stress that may accompany running. The elliptical trainer allows individuals to remain in constant motion and keep the heart rate elevated without causing any impact to joints and cartilage in the lower body. The elliptical also allows the arms to be exercised by contributing to proper form--this is an advantage over exercise bikes, which often require the hands to serve as stabilizing anchors. 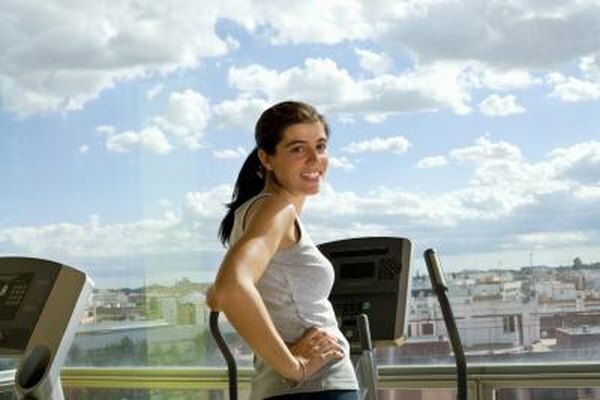 Most elliptical machines feature some form of console, but the accessories can vary widely and play a major factor in how much the equipment costs. Heart rate monitors, calories burned estimators and training program screens are common, as are distance calculators, which help convert the workout on an elliptical machine into a measurable distance. A simple and fairly accurate way to measure distance traveled when working out on an elliptical trainer is by measuring the length of your stride when using the machine. By doing this, you can also figure out how many strides it takes to travel a mile. Start by measuring the distance between the forward-most point of your stride and the farthest point behind you where your foot reaches. Convert this into feet and divide it by 5,280 -- the number of feet in a mile. The result is the approximate number of revolutions you will need to make on an elliptical machine to travel one mile. While the console tools on an elliptical machine often feature a distance calculator, the formulas used to calculate the distance traveled can vary from one machine to the next based on the manufacturer -- and in many cases the reported distance traveled is inaccurate. Also, because the elliptical motion is different than the motion of running on a flat plane, the distances measured may not be exact, although they should be relatively close to the actual distance covered.